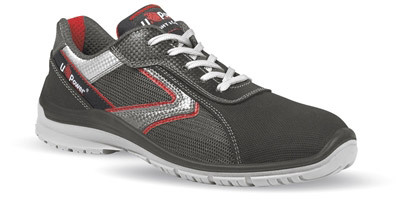 Safety shoe and work clothes in stock! Safety Shoe Free Upower S1P SRC. Soft velvet crust leather with retro-reflective carbon inserts, large lateral vents for the foot to breathe. Wing Tex lining with breathable air tunnel. AirToe mouthpiece. Aluminum perforated safety tip with breathable membrane. Anti-perforation: Save & Flex anti-perforation sole no-metal PZERO +. Removable insole: Action Dry anatomical removable insole preformed according to the morphology of the foot with EVA support. PU soft comfort sole. Outsole: abrasion-resistant PU, hydrocarbon-resistant, anti-static, high coefficient of slip resistance, GelBag insert in the heel support area. Natural Comfort 11 Mondopoint footwear. Sizes from 39 to 46. Weight of the shoe 428 grams or 856 grams per pair. a reference in terms of weight.